Here’s one of my new favorite recipes. It’s basically combining hash browns with an omelet. And the cool part is that it tastes like there’s meat in it…but there’s no meat in it. 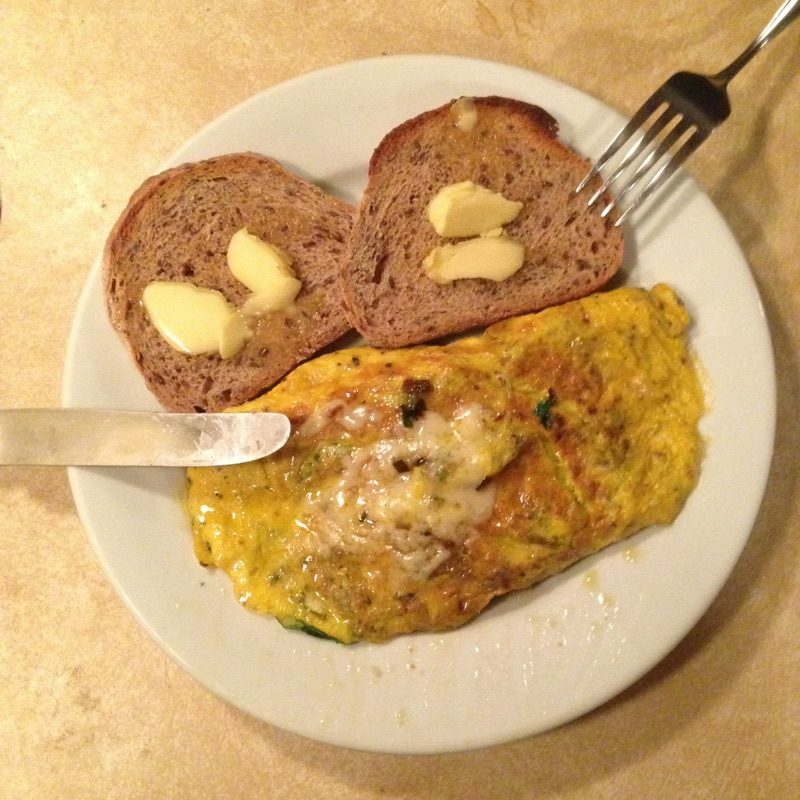 Since this is a great potato year for the farm, you can make plenty of these omelets. Enjoy! 1. In a medium cast iron frying pan, heat olive oil and add chopped onion. 2. Reduce heat and add garlic. 3. Quickly shred the potato and add that to the frying pan. Be sure to spread it out evenly. Immediately, pour about a tablespoon of olive oil over the potatoes. This is important because it helps the potatoes to cook evenly. 4. While the potatoes are cooking, chop up the summer squash and arugula. 5. Whisk together the 3 eggs with the salt & pepper. 6. 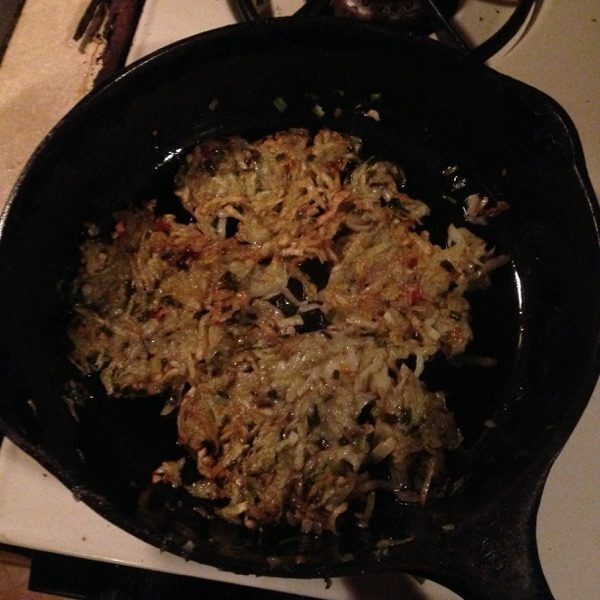 Once the potatoes appear to be browning on the bottom, do your best to flip them over. At this point you can add the summer squash. Wait until the potatoes seem to be brown on the other side, then mix them around with the summer squash. 7. Add the arugula and stir it around until it wilts down. Remove the veggies from the frying pan. 8. Reduce heat to the lowest setting and pour the eggs into the frying pan. Place the cooked veggies on one side of the them. Cover the veggies with several pieces of cheddar. 9. 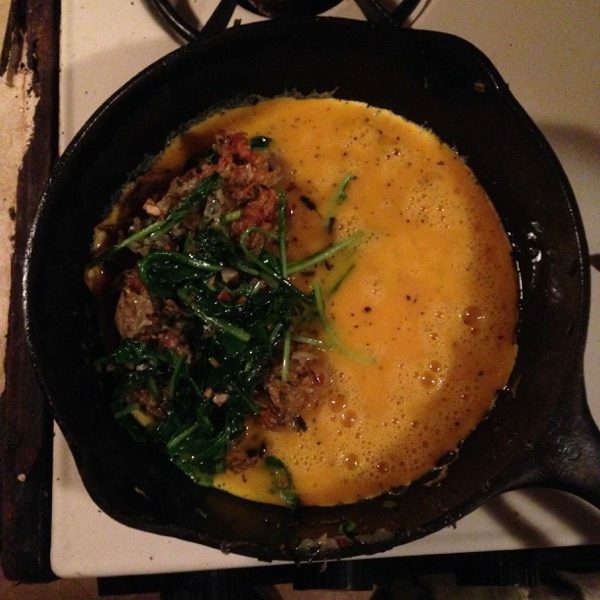 Once the egg is cooked enough, flip the empty side over the veggie side. 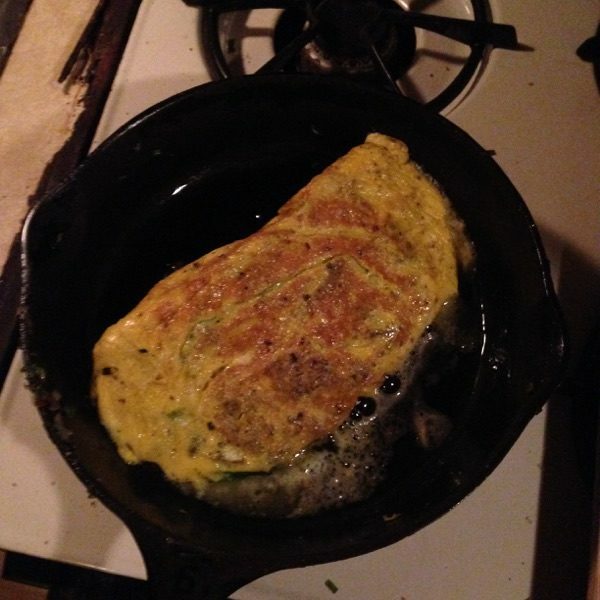 Then flip the whole thing over to help the omelet finish cooking. Turn off heat.